We never truly can say what the market should do, nor can we impose our will upon the market. We can however, through the lens of market profile with a side of auction theory, gauge the likelihood of continuation. This is why they keep me around, these guys. I probably would have started locking in longs like many of you if I stayed at my trading terminal, the most aggrandized name for my bossed up PC. After all, what a pungent thrust, certainly it would be prudent to raise cash. I pulled a PTJ and headed to the gym an hour before the bell to avoid the angst. The P-shaped profile is known as a short squeeze. 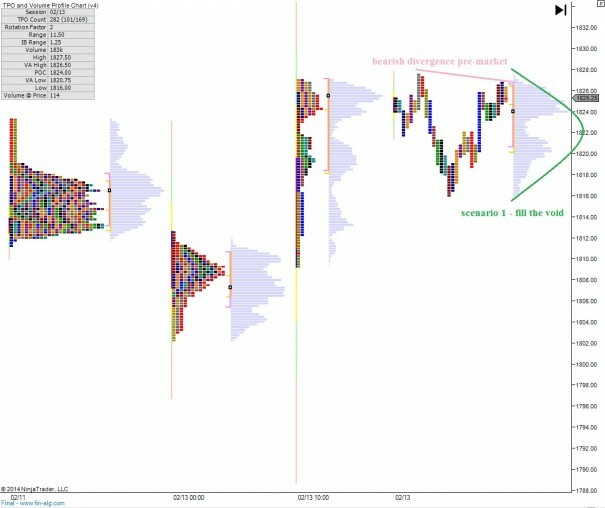 This is a temporary phenomenon in some cases, and when they occur in the context of a downtrend they often mark the end of the countertrend. 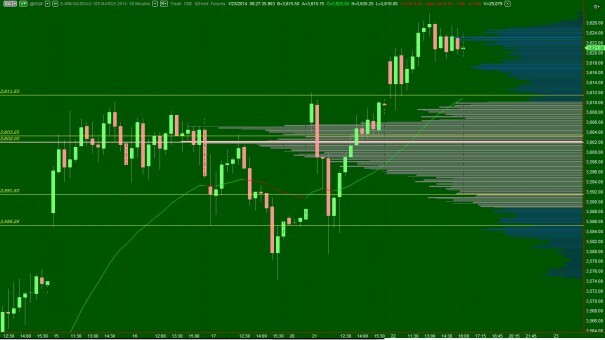 The key is keeping your intermediate timeframe clear. Is this a downtrend? If you have ever been to a live auction then you have seen this action, or if you have been to a stingy charity event then you have seen the opposite action. An item is rolled out and the auctioneer begins their banter about starting bid. If no one bites then they drop the initial bid. Once we have interest the process begins. At the tight-pocketed charity event, after two or three hands are raised everyone starts looking around, afraid to raise their hands. The auctioneer starts using tons of filler noise, making it seem like the auction is still active when really it is dead. The opposite is when higher prices actually bring NEW participants into the auction. They have seen the activity and when it reached higher advertised prices it enticed them and they wanted to buy. The auctioneer is saying very little filler, and the price continues climbing. I see that rising VPOC as higher advertised prices generating buying interest. 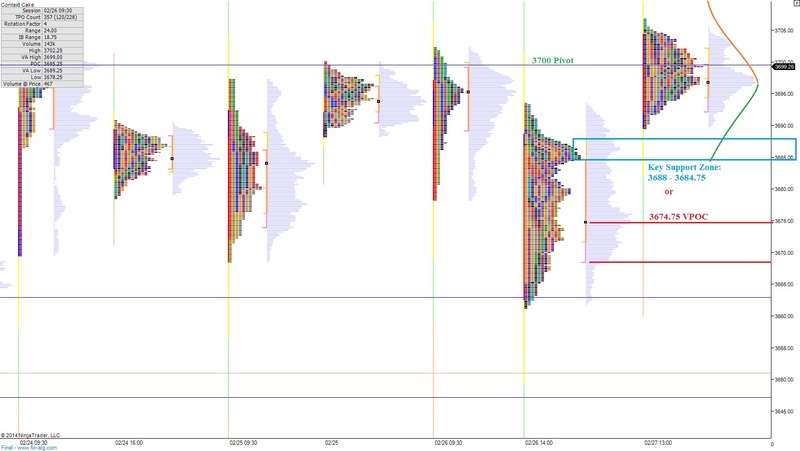 And even through these are not quite trend day profiles, I am pressing my longs into tomorrow as these contracts trade at all time highs. 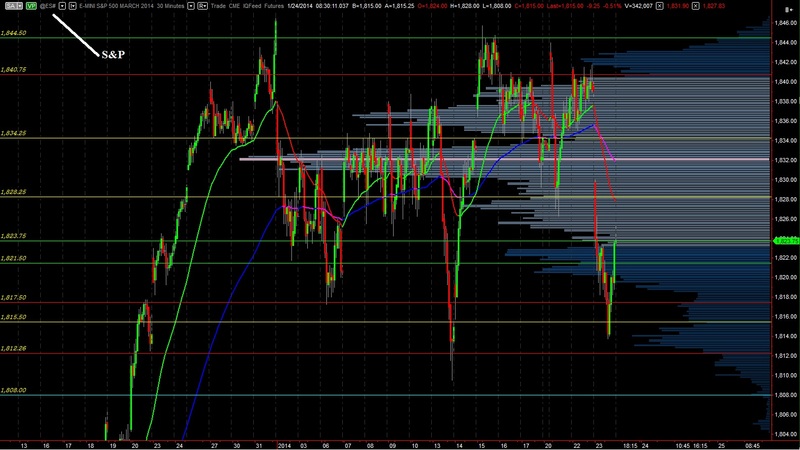 The S&P 500 via its electronic futures contract the /ES printed a poor high on the session. This refers to a high watermark printed as a double or even triple print. It is very uncommon for such a print to mark swing high. 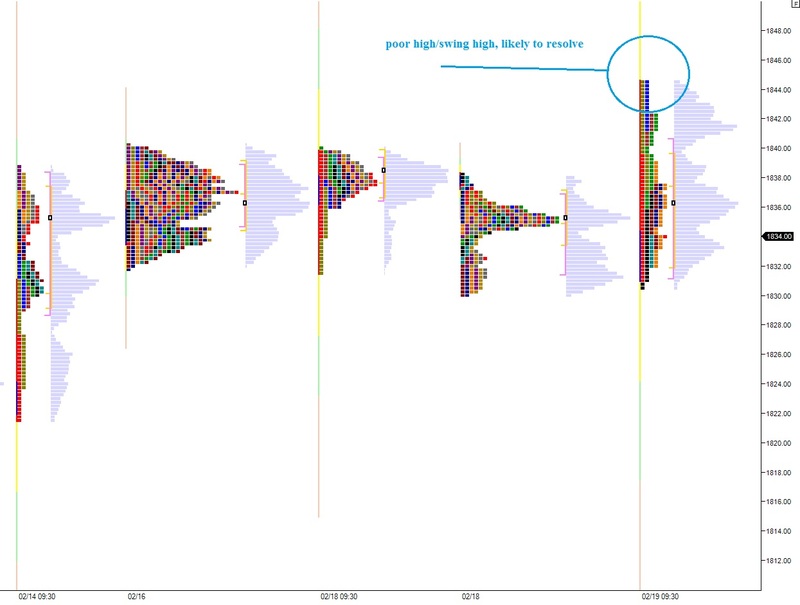 Given our recent swing high this morning, it lends a bit of confidence to being long…at least until a new high is made. 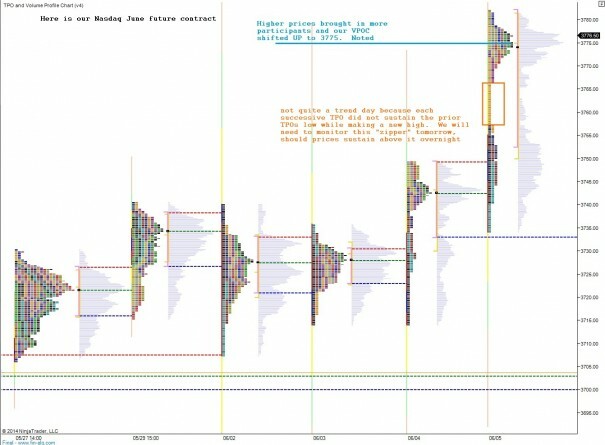 The equity futures markets were balanced overnight, however rather opportunistic given the large range and impressive volumes. 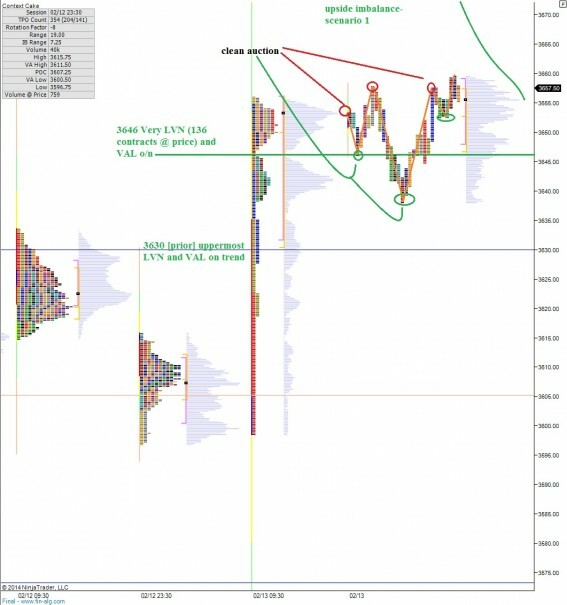 The actual auction that took place overnight was very organized and saw good participation from both the buyers and sellers who both seem to be willing to participate at these levels. This suggests we are coming into balance. Yesterday was interesting and the morning vision work paid off in spades. Inside 12631, I was taking through the profile development. Within the first half hour of trade my entire upside scenario had been captured by a strong opening drive. This was OTF (other time frame) action, or the long term timeframe asserting itself on the marketplace. OTF shows no regard for support and resistance levels seen on the daily and even intermediate term profiles, instead opting to plow money into the marketplace. 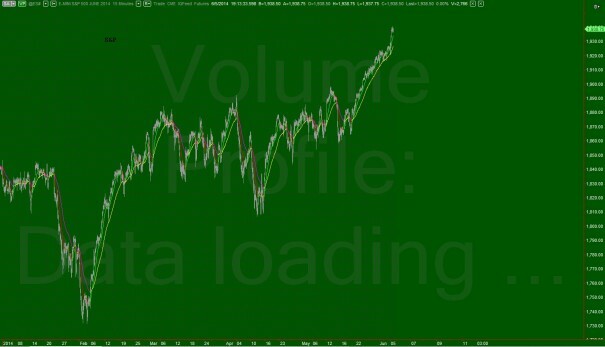 It did not take long to recognize the trend day activity and grab on and ride it until the wheels come off. Also, have a Happy Valentine’s day. Be extra gay and sappy with your special someone. But don’t forget about the industrial production numbers at 9:15am and consumer sentiment at 9:55am. Carry on. Grand morning grand traders, may you fill you wallets with several grand this month. I want to turn your attention to the 30 minute /ES_F chart, our futures contract representing the S&P 500 index. 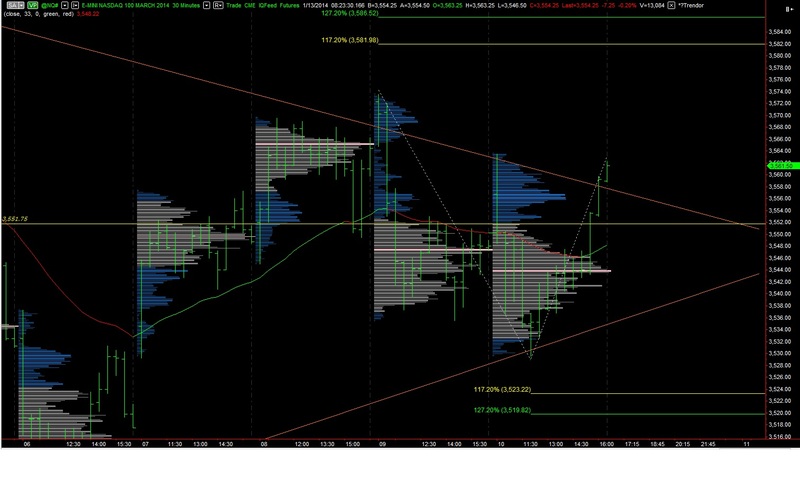 You can see price working a rotating off of a bounce last week, but encountering some resistance. Such is the challenge any marketplace encounters when working through a glut of supply. Remember all of that egregious buying I did last month? Supply. Anyhow, I think the SPX is important this week, especially if we see this weakness which is creeping in right now follow through in the afternoon. With Goldman Sachs on the cusp of a breakdown and little Miss Yellen on deck, everyone is feeling a bit skittish. An overall aversion to risk at this junction makes sense, just like taking little jabs at mother Russia from your broadcasting sofa. 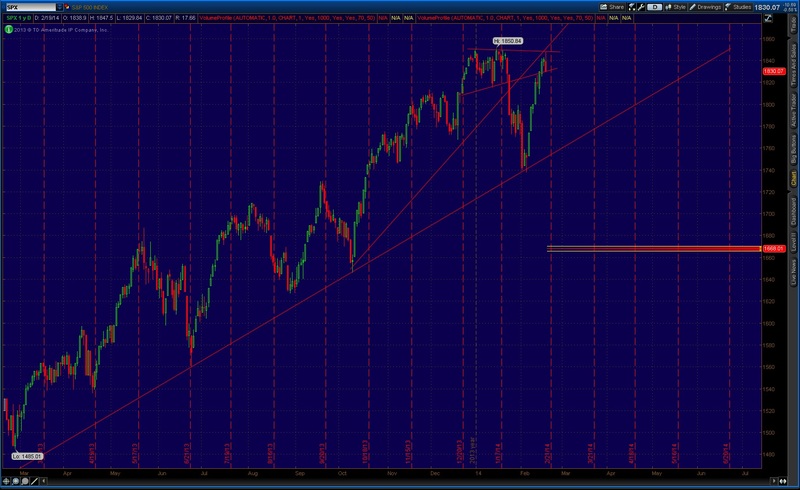 The path our SPX is taking looks familiar, and is entering a long only environment I am very fond of. Should we find buyers around 1770, I will be pedal to the metal long. And wouldn’t it just be swell if I could shed this TZA hedge in the green? I know you all wish the best for your humble market broadcaster. 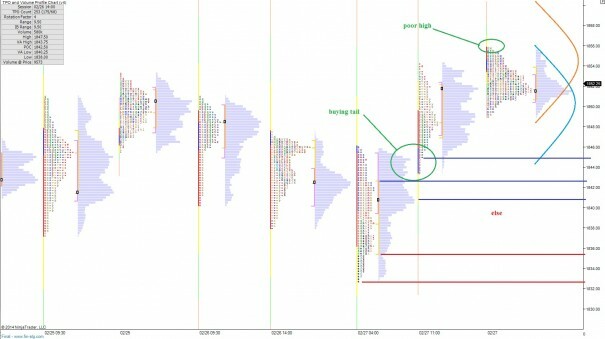 More waves of selling rippled through the marketplace last night, as the afternoon bounce in both the S&P and NASDAQ were faded. A bit of a risk divergence emerged from the move. 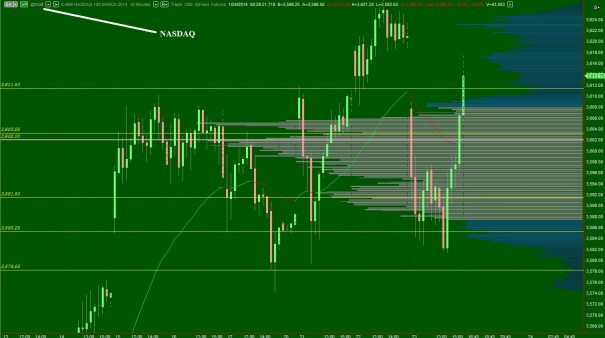 While the S&P was able to take out our low on yesterday’s session, the NASDAQ held. Since reaching short-term oversold conditions on both indices, we are coming off the lows into the early USA hours. With my really fancy futures data (FFD) I get to a clean look at exactly the ticks where events of interest have occurred. I share these ticks with you, finest people of the interwebs, because we should all have this information available while making our educated guess on market behavior. I will make one note and then present my intermediate term balances. Yesterday the NASDAQ market profile print had a smack of long liquidation—a temporary market phenomenon driven by forcing participants to liquidate their positions. It resembles a lowercase letter b. 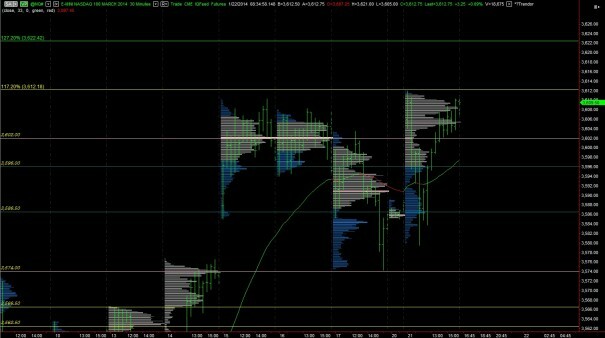 These typically signal a strong initiative seller entered the market in the morning, but the force of selling was met by sufficient buy flow. As a result, no further progress was made in the afternoon. This is what may have sparked the afternoon ramp. Be aware there are large timeframe traders here, aggressively battling for control of an intermediate term balance. Try not to get too beat up in the waves they produce. 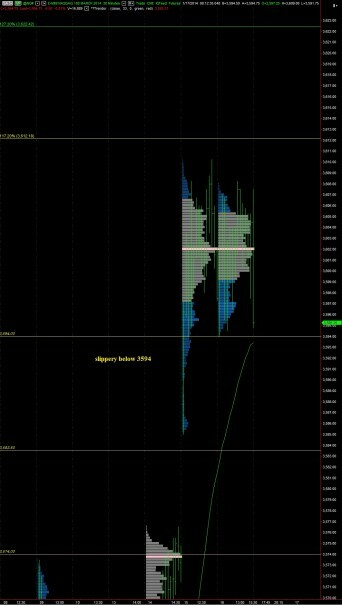 Sell flow worked though the markets last night after the buyers pressed a bit higher during the globex session. The S&P continues to lag the NASDAQ and one must start to consider which one of these indices is telling the story here. One of the subtle cues the market gave us yesterday during the selloff was the divergence between the NASDAQ and the S&P. As prices in the S&P made lower lows verses Friday trade, the NASDAQ diverged. This is a risk divergence and was the first catalyst to take out your shopping list and build some risk. 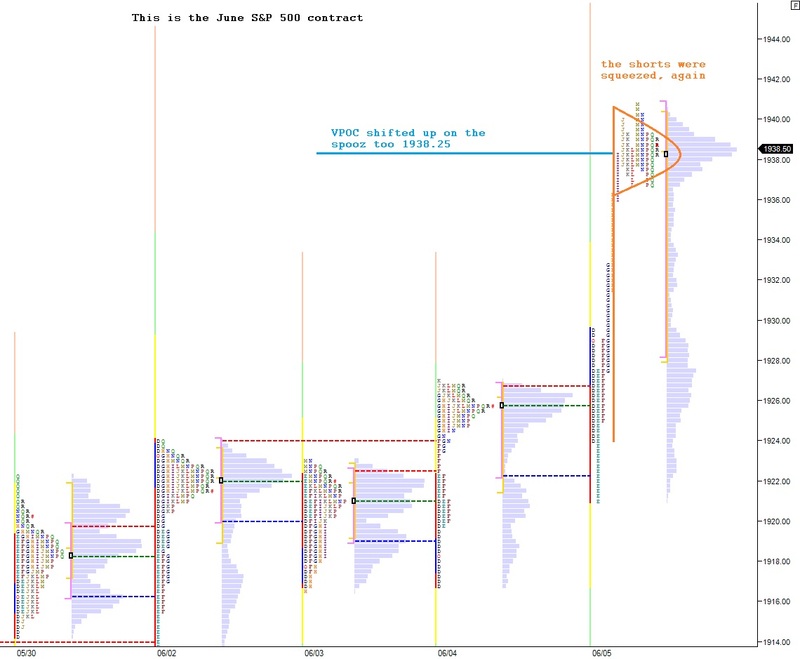 Sellers were able to sustain control in the S&P on the net session by extending the initial balance lower, taking out prior day lows, printing a lower high/lower low, and pushing value slightly lower. 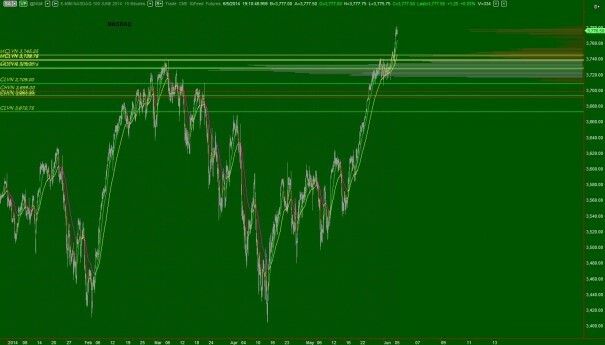 The NASDAQ was not as clear in regard to control. Sellers extended the initial balance lower but never took out Friday lows. 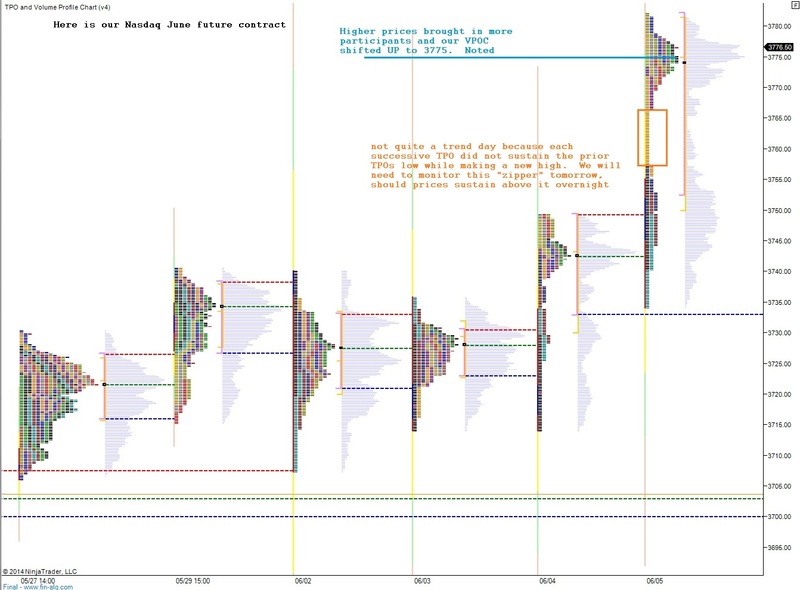 We printed a higher high /higher low and value moved to its highest level this year. Turning our attention to the NASDAQ, overnight prices went to new swing highs at 3621 before finding sellers. Since then price has bounced around a bit in a relatively balanced manner with a bit of a buying wick up top. This gives us two bits of sentiment. 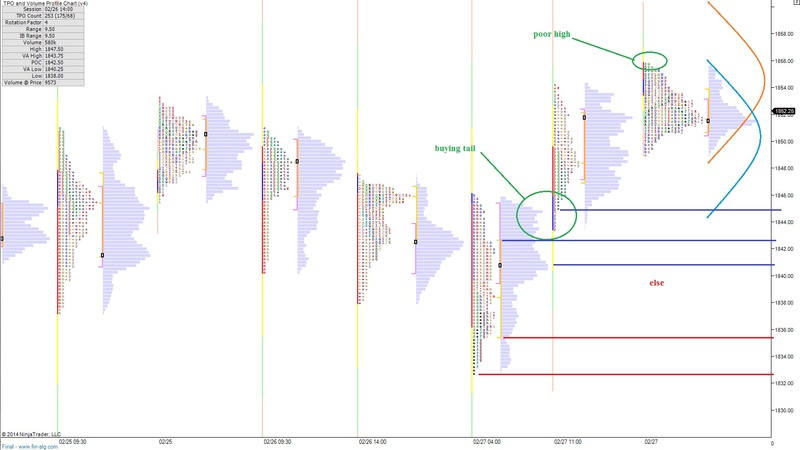 First, swing highs are rarely made outside of regular market hours, thus the overnight high is vulnerable. Second, the overnight inventory is net long, thus we may see some sell flow early on. 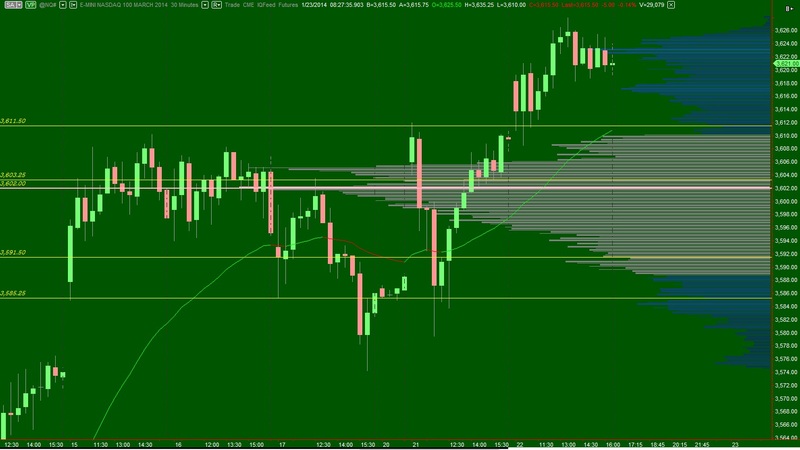 We are trading slightly above yesterday’s close which presents a potential gap fill trade back to 3609.50. Futures are up down a bit overnight after a busy night. S&P futures printed over seven handles in range while the NASDAQ printed an eighteen handle range. 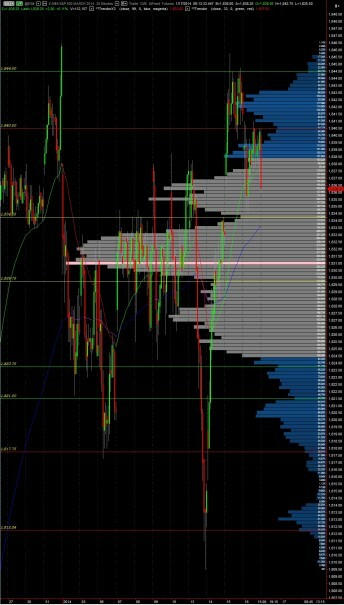 The action was fast at times and the resulting market profile print shows no signs of balance. We have a busy economic calendar today including some premarket data. 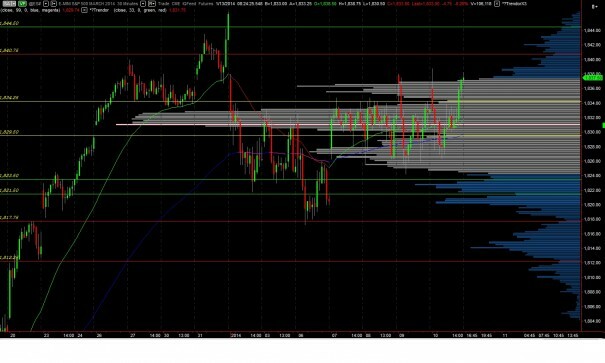 However, as we approach US trade markets are set to open in range and in value presenting us with a lowered risk reward environment. 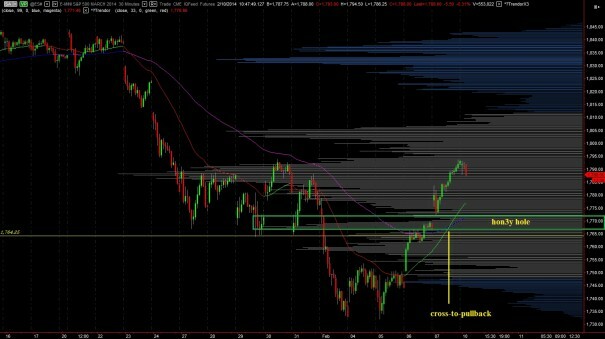 This condition could be favorable for individual stocks since the mild climate will not exert macro forces on these plays. It will be important today to see who is in control of trade. 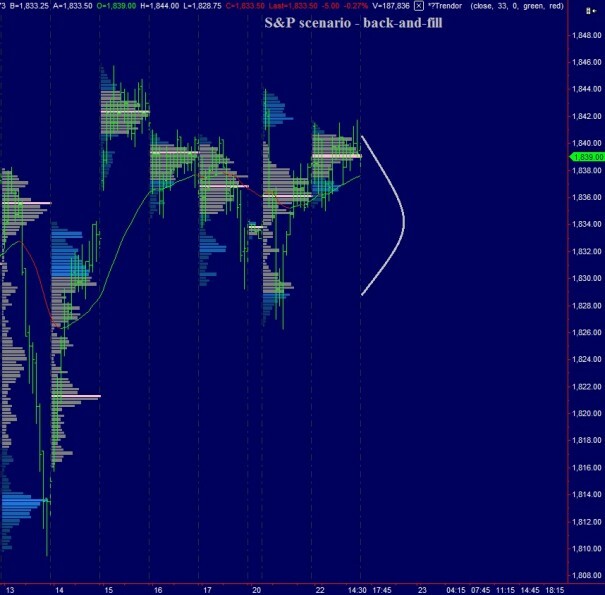 Yesterday the action was predominately controlled by the local time frame (LTF) and this could be seen as value area highs and lows being faded back to the VPOC all day. 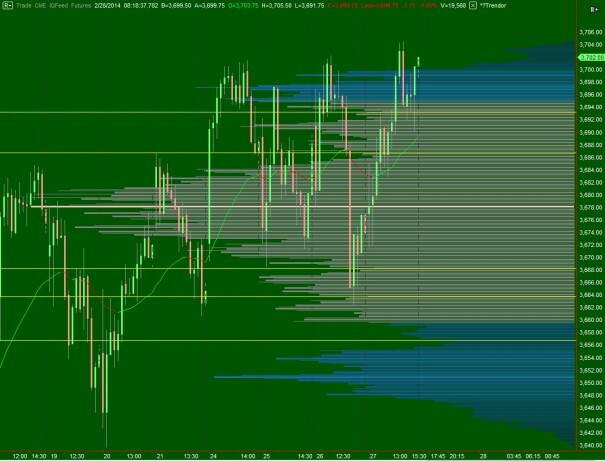 These choppy conditions lack the order flow of other time frame who push us out of short term balance. 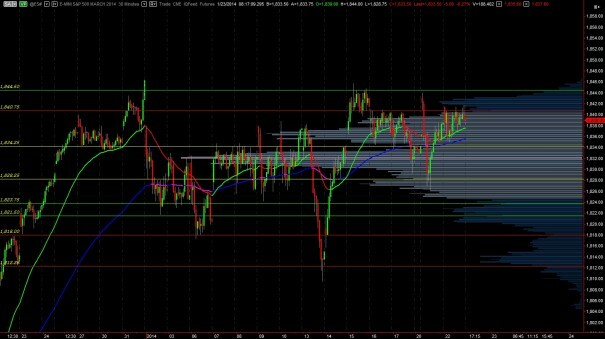 The behavior of the equity markets last week cleared up any uncertainty as to whether or not everyone was back to doing business. Volume increased in most instruments and move have increased in size and speed. 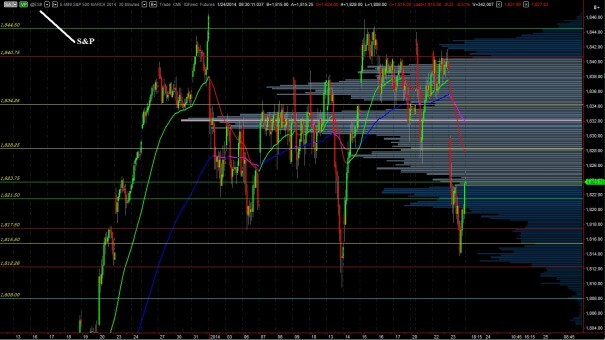 Both the NASDAQ and the S&P have been chopping around which creates opportunistic conditions for day traders. These benign conditions have allowed individual pockets of momentum to make large runs too. 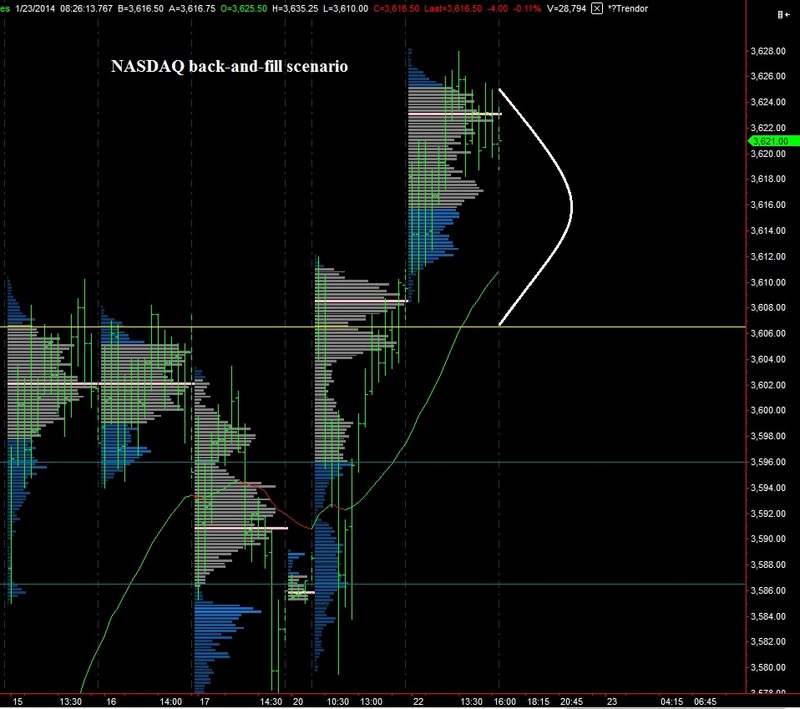 Next I have made RTH volume profiles for the NASDAQ via the /NQ contract. These will assist me in observing the day session and who is asserting control of the tape. 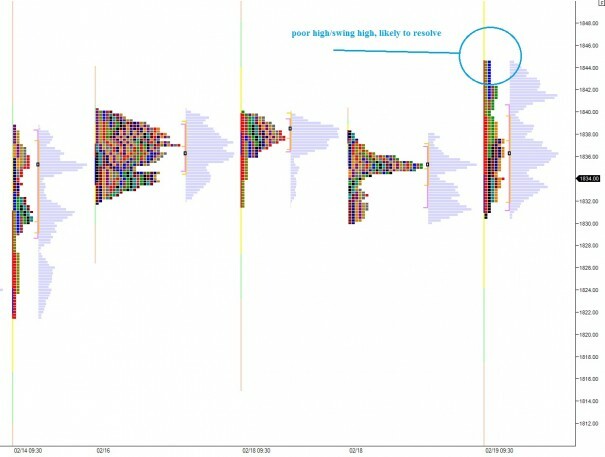 We can see price consolidating recently. The past four sessions have been “P, P, b, b” in structure. In other words, two short squeezes then two long liquidations, but neither time did the consolidation break. This is big players wrestling for control.